Don Anthony Realty combines the best services and aggressive marketing techniques of traditional real estate companies while offering low commissions. We understand how buyers buy homes, so we use the Internet and marketing techniques that work to sell your home without charging you a full commission. 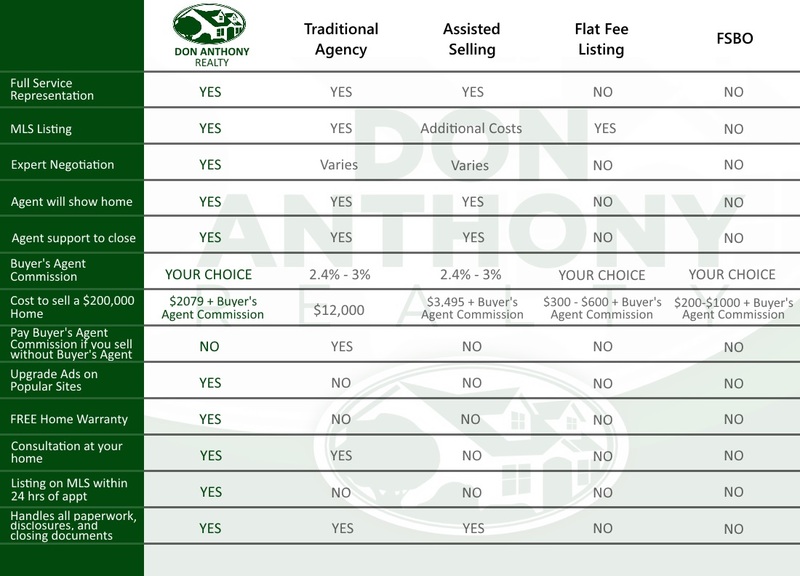 How does Don Anthony Realty stack up to the others? Don Anthony Realty provides the full-service representation, advice, and negotiating skills of a traditional real estate company. Since we work in large volume, our agents are usually much more experienced than the ones representing the buyer. That can mean savings for you, while also getting the price you want. Don Anthony Realty will save you money, while in many cases actually providing better marketing and much more professional and experienced representation. Assisted selling offers flat fees lower than most traditional real estate companies-but not as low as Don Anthony Realty. Plus, you don’t always have the option to set your own buyer’s agent commission. With Don Anthony’s experienced and local team, feel confident you have the best representation available. Assisted selling doesn’t always offer this same expertise. 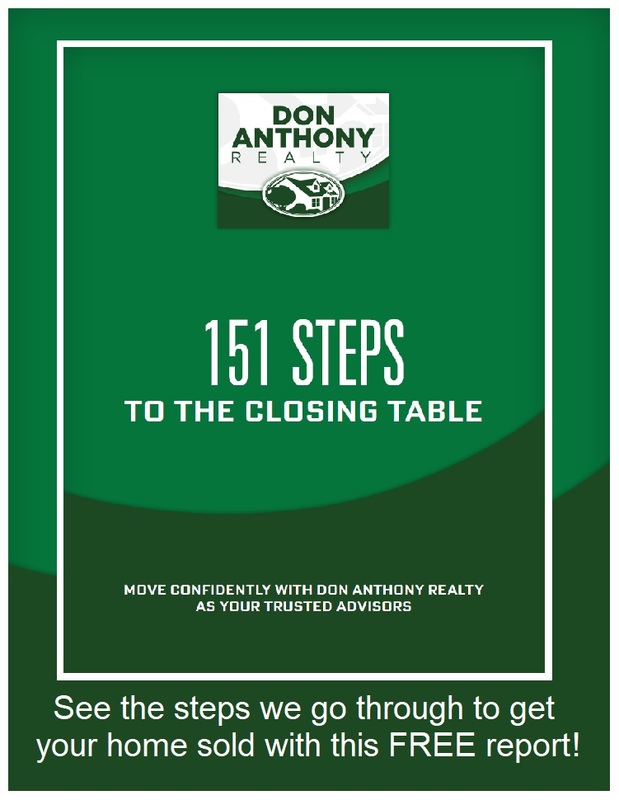 Franchised companies don’t have the flexibility of an independent company like Don Anthony Realty to work with their clients. We are our own bosses, so we have the ability to do whatever we need to do to make sure our clients are happy. Sure, flat fee companies bring low costs (sometimes), but what about the services? With the limited advertising of most flat-fee listings, you will almost always have to pay a buyer’s agent commission making your costs higher than Don Anthony Realty. We never compromise on service, and we offer more aggressive and experienced negotiating and representation than most flat fee companies. The local Don Anthony Realty team is with you throughout the process. Don Anthony Realty also allows you to set your own buyer’s agent commission. Unlike Don Anthony Realty, most flat fee companies won’t show your home, or even come to your home to list. You stay in control with For Sale By Owner, but buyers often discount the price since they know you aren’t paying commissions. We let you keep that control, as you decide how much you want us to be involved. You pay low cost fee for service, not for work we don’t do or you don’t need. As a FSBO on your own, you just don’t have the ability to market your home on the major websites, search engines, and databases where most buyers are looking for homes. With Don Anthony Realty, you still save money…And get Local MLS listing, expert representation, and incredible exposure.